Family went to the water park without me, so I have a little free time. Grocery shopping and gardening and World Cupping and eventually I probably gotta shave and shower for the Main Event tonight. Yep, Pike Beer Tasting at Total Wine in Boynton Beach with the honorable Ed Roberts presiding. So be ready for tomorrow's post because I just gave it away what you'll be reading about! There are only gonna be 10 of us but we're a rowdy bunch! 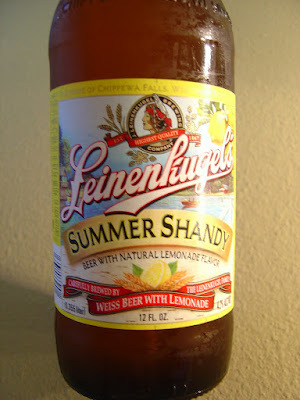 This morning I'm drinking Summer Shandy brewed by Jacob Leinenkugel Brewing Company in Chippewa Falls, Wisconsin. This is a Weiss beer with Lemonade; 4.2% alcohol. The label has some kind of Lodge Adventure sweepstakes code on it. Hold up. Let me see if I'm a winner. OK that was perhaps the worst sweepstakes experience I've ever been a part of. I didn't just need to enter my code. I needed to enter all contact info, which I did. Then apparently I failed on their hand-written Captcha. Then I corrected it and nothing happened. What a waste of time! Very lemony and tart aroma, like lemonade. Tart zing to start, like a sour lemon candy. The upper level carbonation makes the lemony flavor last a few seconds and dance around. Then there is a light spice and that's the end. Repeat. Very refreshing. Perfect for someone that doesn't appreciate beer but wants a hot-day drink which is probably what the brewery was going for. Destroys Bud Lite Lime. I know that lemons and limes aren't the same, but my wife doesn't. It's still a raging battle after 13 years (Latinas! LOL.) You should already know if you're going to like this. Pee in a glass, squeeze some lime and its pretty much the same result as Bud Lime.